Welcome to Simply Tablecloths, the UK’s home of stylish and wipeable tablecloth designs. These are our premium range which have a softer and more natural feel like linen. Otherwise known as acrylic tablecloths, these are made from a poly cotton base fabric, coated with two layers of acrylic and then topped with a Teflon finish to make the ultimate wipe clean tablecloth. 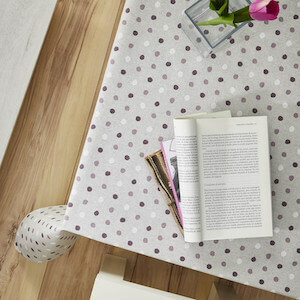 Oilcloth tablecloths have a base fabric which is made from 100% cotton. The design is printed on to the surface and then coated with a layer of clear pvc to give it a wipe clean finish. This is the most hard wearing of our products. Some people may also know these are pvc tablecloths – which are not to be confused with vinyl pvc. Vinyl tablecloths, also known as plastic tablecloths, these offer the best value when looking for wipeable tablecloths. Designs are printed on to the vinyl PVC surface and have a white non woven polypropylene backing. Table protector is a padded layer designed to go under your tablecloth. It helps protect your table top from knocks, scratches and heat damage. We have 3 types of protector available: classic, non-slip & executive felt. Have your tablecloth or protector sent on a cardboard tube to receive it crease free. Pre cut and fitted parasol hole for your garden tablecloth. Keep your tablecloth in place. Great for outdoors when it is windy. Add a neat finish to your tablecloth by opting to have the edges bias bound. Our home interiors buyer has sourced and chosen a wide range of fashionable UK wipe clean table cloths for your home, garden and business. We have tried to make choosing your design as simple as possible and our free sample service ensures you make the perfect choice for your home or business. If you are unsure of the tablecloth size you need, then be sure to use our size guide to help you out. Whether you have gone with a polka dot design or just a plain one, once you have found the design you love, you just need to select the size and shape required. Our in house cutters allow us to cut to any size you need as well as cutting to four different shapes which include rectangles, squares, ovals and round tablecloths.